Yesterday found me standing on the aft deck of Falkor, gripping a rope to hold the swinging CTD rosette steady as we lowered it over the side and into the ocean. The rogue wave that crashed across the deck managed to soak my work boots and my jeans up to the knee. 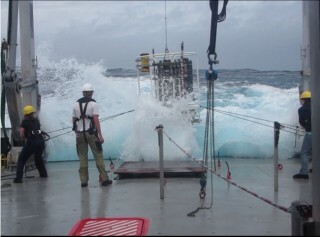 Even in fairly good weather, ocean fieldwork is unpredictable. In a storm, it may be impossible. 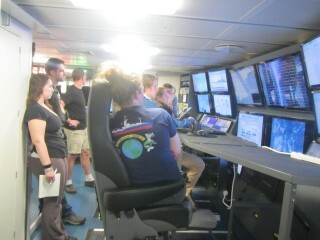 We’ve been tracking the weather forecast for the Tasman Sea in much the same way a fervent sports fan follows their favorite team – pleased anticipation when the forecast shows low winds and small waves, turning to annoyed frustration as the weather map lights up with orange and red, telling us it’s going to get rough out there. Storms are not unusual here. The Tasman Sea sits just north of the great Southern Ocean; a notoriously rough and stormy place. This ocean is unique in that no continental landmass interrupts its rushing path around the globe. In the Northern Hemisphere, if you try to sail from West to East, you’ll run smack into land eventually – California, Oregon, or Washington for example. But between us and the craggy, frozen shores of Antarctica there is only ocean, wrapping around the Earth in a massive torrent. I’m grateful we catch only the edge of the weather from the Southern Ocean, where winds are often 30 mph and 20 foot tall waves are not uncommon. The fastest ocean currents, confined to a 1000 mile wide belt called the Antarctic Circumpolar Current (ACC for short), carry millions of tons of water through Drake Passage every second. This current is an important branch of the global pattern of ocean circulation, sometimes called the `ocean conveyor’. Today the Tasman Sea is sunny and calm, with water the color of slate rolling smoothly past Falkor’s bow. 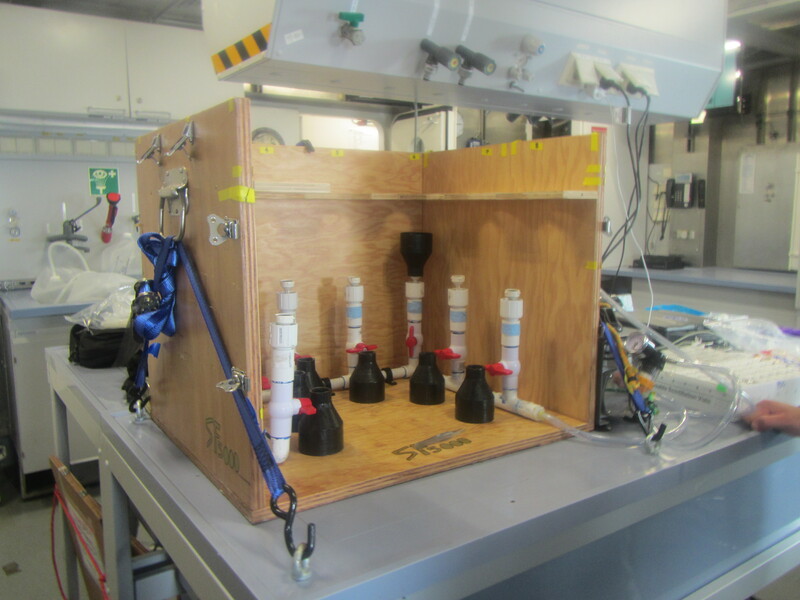 We pulled the CTD rosette out this morning to collect water samples from the giant gray plastic Niskin bottles strapped to the frame. Pete, our resident biologist, taught us how to filter the samples to measure chlorophyll (the photosynthetic pigment used by phytoplankton) and organic carbon (an indication of biological productivity). 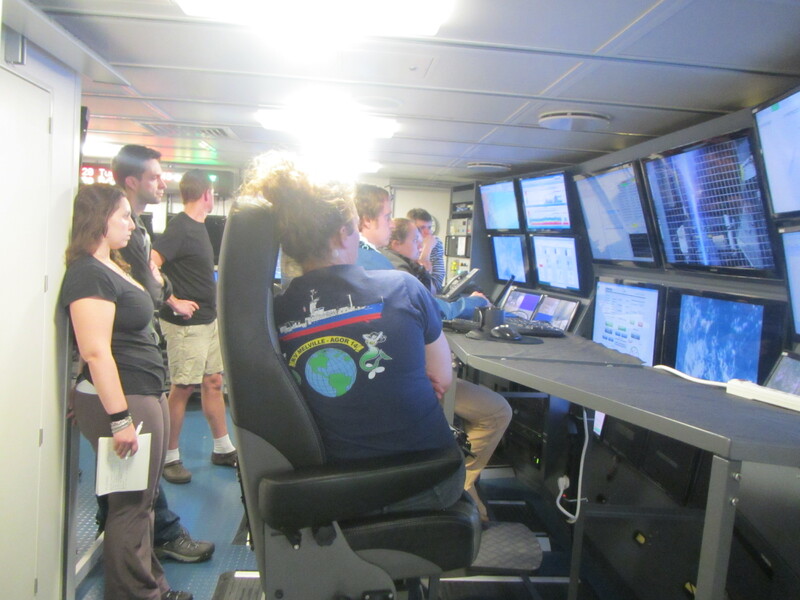 The CTD itself records a slow profile of temperature and salinity that we watch appear on the screens in the science control room. Unlike most CTD rosettes, ours also holds the ADCPs and four tiny Chi-pods with glass beads on their tips. 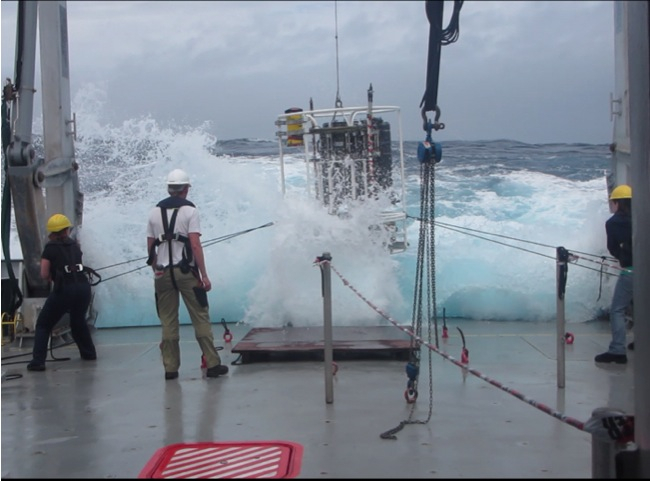 These measure ocean current speeds (ADCP) and determine turbulence by sampling temperature 100 times per second (Chi-pod), helping us track the energy carried by the tidal beam across the Tasman Sea. 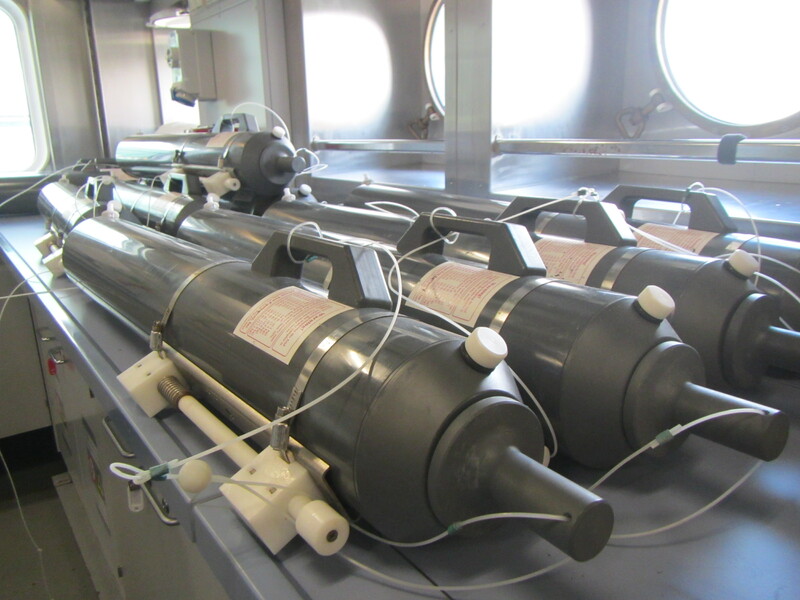 Energy transport is only part of the story of physical oceanography. Both carbon and heat transport are also particularly important to the Earth’s climate. As the ACC flows around Antarctica, waters sink toward the ocean floor, carrying heat and carbon with them, sometimes to be stored for hundreds of years. Oceanographers are still working to understand exactly how much heat the global ocean absorbs, but right now it looks like about 90% of the heat from global warming ends up there. Thanks to its high heat capacity, ocean water is still pretty cold though, especially when you are up to your knees in it on a windy day! And even small changes in ocean temperature can have large biological effects, like coral bleaching on Australia’s Great Barrier Reef. 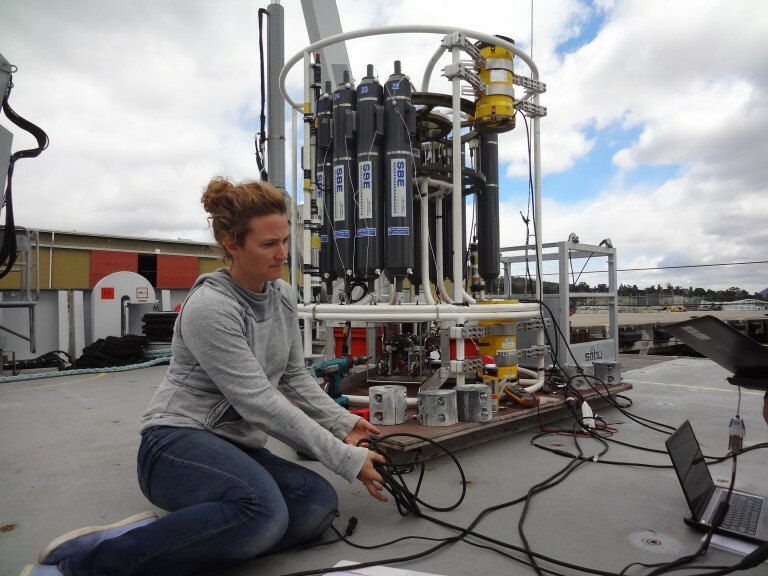 Here’s hoping the Southern Ocean keeps its stormy weather far to the south of us, and we can keep working to figure out our piece of the bigger puzzle of ocean and climate, one pair of soggy work boots at a time!